With over 7,000 islands and a magnificent coastline, it’s no wonder that the Philippines are known as “Asia’s Diving Capital”. The Philippines has the widest variety of marine creatures in the world; divers will often see sharks, rays, octopus, moray eels and sea snakes, as well as hundreds of different species of fish, including tuna, groupers, jack, surgeonfish, parrot fish, sweetlips and lionfish, to name but a few. There is also a huge variety of both hard and soft corals (more than 500 species in all). It is widely believed by scientists that many of the Pacific’s marine organisms evolved in Southeast Asia before they colonised other oceans. The variety of marine life is astounding and caters to all levels of dive enthusiast. In the Philippines you can dive from the shore, from a safari boat or from a liveaboard. Whichever you choose, you are guaranteed a wealth of experience and encounters that cannot be found anywhere else. Anilao, in the municipality of Mabini, boasts more than 30 dive sites. The rich coral reefs are home to an abundance of marine life, and the vis is good for the majority of the year. Anilao is just two-and-a-half hours’ drive from Manila and is a popular centre for day and weekend trips. Anilao is an up-and-coming resort centre for diving, with facilities ranging from basic to world-class. Many of the dive sites front the resorts, so you don’t need to hire a boat – just jump of the pier, dive 10-18 metres down, and you’re there. You’ll find coral slopes, steeps, drop-offs and shallow coral gardens intertwined with sandy patches. The world’s nudibranch specialists rate this region as one of the best throughout the globe for sea slugs, so it’s no surprise that divers (especially those who are interested in macro photography) are attracted to Anilao’s reefs. You will also find that other invertebrate groups are well represented in Anilao, including soft corals, stoney corals, worms, crustaceans and echinoderms. This combined with regular visits from dolphins, whales and turtles makes Anilao one of the richest marine areas that the world has to offer. Other dive sites in Batangas offer equally impressive and exciting opportunities for animal encounters and exploration, such as Balayan, Nasugbu and Verde Island. First mapped by the Spanish in 1521, Puerto Galera was rediscovered four hundred and sixty years later by another set of explorers – scuba divers. Now ranked in the top three Asian destinations for diving, Puerto Galera was declared a Marine Reserve by the United Nations Man and Biosphere Program in 1974. The area is home to an abundance of exotic fish species that are seldom seen elsewhere in the Philippines, including purple fire gobies, blue ribbon eels, cleverly camouflaged frogfish and ghost pipefish. There are over two dozen prime dive sites in the area that are all well worth diving – and what’s more, diving in Puerto Galera is possible all year round. Mindoro is also home to the 34-kilometre long Apo Reef, which is widely regarded as the second largest reef in the world. Home to approximately 400-500 coral species and fauna such as sharks, stingrays and manta rays, Apo Reef is just a 2 or 3 hour journey from Mamburao, the capital of Mindoro Occidental. Jacques Cousteau once spoke of Palawan as “the most beautiful place I ever explored”. Consisting of 1,800 islands, Palawan offers many excellent dive sites. Regarded as the Philippines’ last ecological frontier, Palawan provides world-class diving and a diversity of wildlife that cannot be found in any other part of the archipelago. The Calamianes Island group consists of 160 islands off the northern tip of Palawan. The main islands are Coron, Culion, Busuanga, Calauit and Linapacan and they offer some of the Philippines’ most stunning scenery, ranging from massive limestone cliffs, caves (both above and below the water), hot springs, thermal lakes, jungles, rivers and mangrove swamps. Coral and Seagrass border virtually all of the islands, and various inlets and bays provide a diverse array of marine and coastal habitats. Coron is particularly well known for wreck diving, due to the allies carrying out a daring air raid against a fleet of 18 Japanese ships anchored in Coron Bay in WWII. The devastation that was left behind all those years ago provides one of the most exciting dive sites in the world today. Due to its remote location, the site is rarely visited by tourists, making it one of the best kept secrets of the Philippines. Accessible by liveaboard, the Tubbataha Reef Marine Park is a unique example of a pristine atoll reef. Home to a high density of marine species, the site boasts a magnificent 100-metre perpendicular wall, extensive lagoons and two coral islands. Visayas is the region which contains all the islands between Luzon and Mondanao and can be found at the heart of the Philippines. Cebu is the region’s international gateway and provides connections to all of the Philippines’ most exciting diving areas. Close to the city of Cebu is the island of Mactan, where you will find 5-star dive centres and easy access to a vast array of diving adventures. To the north is Malapascua, where you will find white sandy beaches, crystal-clear water and a coastline that is ideal for diving, swimming and snorkelling. To the west you will find Moalboal, a sleepy little market town where you can dive from the shore at Panagsama Beach and discover an extraordinary variety of corals, sponges, anemones and a whole host of brightly coloured reef fish. Pescador Island, a tiny coralline limestone island that is considered a microcosm of the best of Philippine diving, can be found a couple of kilometres off the coast of Moalboal. To the south is Sumilon Island, an old marine sanctuary with black corals, stony corals, gorgonian sea fans and caves that are teeming with vast amounts of juvenile fish. Across the channel from Cebu is the island of Bohol, where diving is found along the western and south western coasts. Some of the best diving in the Philippines can be found at Cabilao Island. Particularly well known for sightings of hammerhead sharks, the Island can be easily visited from the resorts of Mactan Island. Beneath the waves at Balicasag Island, a marine sanctuary known for its historical lighthouse, vertical walls disappear off into deep water. This combined with strong currents means there is a lot of healthy coral and plenty of fish life, and the area gets quite a few pelagic visitors too. Alona Beach at Panglao Island is by far the best white sandy beach you will find in Bohol. The diving here is varied, with steep walls and caves, coral gardens near the surface and overhangs and crevices where you will find all manner of fish and invertebrates. Mantas, hammerheads and even whale sharks can be spotted here. Siquijor Island was known as “Isla del Fuego” by the early Spaniards. It means “Island of Fire”, and it was called this because the island gave off an eerie glow as galleons passed by it at night. It’s long been said that the islanders possess strange magical powers (much to the amusement of the locals!). Coral reefs here are surrounded by colourful and unusual marine life. Siquijor Island is a macro photographer’s dream destination – night dives here will never be forgotten. Carniguin Island is pear-shaped and is home to seven active volcanoes. Jicduf Shoal is one of the best dive spots of the island and is the perfect site for novice divers and underwater photographers. If adventure and excitement is more your thing, Burias Shoal is the site for you. Here you can find schools of tuna, jacks, mackerel, surgeons and barracudas. The shoal also boasts a lush black-coral-covered bottom. Strong currents can make the diving a little tricky here at times, but the experience is well worth it. At the southern tip of the island of Negros is a small volcanic hump known as Apo Island. There is a protected reef there that is home to a famous site called Clownfish-City, due to a rare phenomenon where hundreds of clownfish live together. Apo Island is also well known for its huge variety of both hard and soft corals. While Palawan is regarded as diving’s last frontier, Southern Leyte may well be diving’s undiscovered frontier. Dive sites such as Sogod Bay, Tangkaan Point and Limasawa Island are home to some of the most diverse species of coral and fish that can be found in the Eastern Visayan corridor. Borocay is a magnificent national marine reserve and is widely regarded as one of Southeast Asia’s most popular dive spots. With one of teh best beaches in the world, Borocay is home to 18 state-of-the-art dive centres that offer an entire range of diving experiences, from discover scuba to advanced-level course. 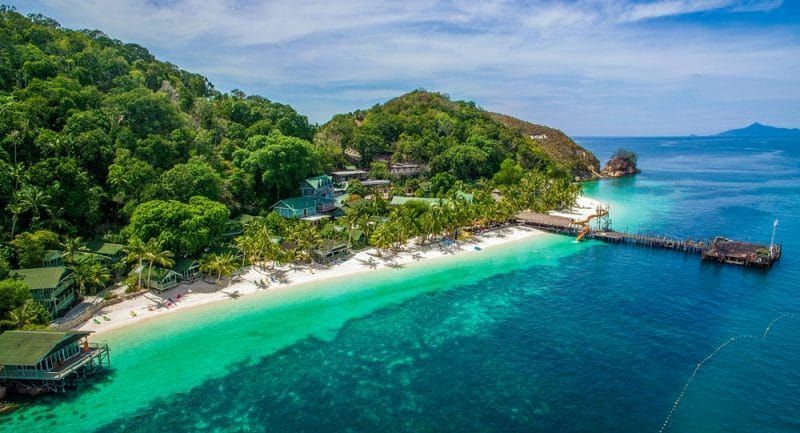 There are numerous high quality resorts, restaurants and bars in the area too, which combined with the fantastic diving that is on offer makes Borocay an exciting destination for divers. For decades, high numbers of whale sharks have migrated to Donsol, which is considered by many as the whale shark capital of the world. Time Magazine has recognised the WWF-supported whale shark interaction program in Donsol as “The Best Place to have an Animal Encounter”. Subic Bay is located on the west coast of the main island of Luzon, which is about 120 kilometres north of Manila. With its own international airport, Subic Bay has a strong tourism support infrastructure of hotels, marina, yacht club, shopping arcades and restaurants. Subic Bay is aalso home to some impressive wrecks, such as the Japanese Luxury Liner Oryoku Maru, the 19th Century Spanish gunboat San Quintin, and the USS New York, which was scuttled in WWII to prevent the Japanese from getting their hands on her 17-inch main guns. Language: The national language is Filipino, however English is widely spoken. Climate: March – June: hot and dry. July – October: rainy. November – February: cool.